The Howard Foundation commissioned Tim Rawle to be the author and photographer of ‘A Classical Adventure’, a book about Downing College published in September 2015 and already lauded by The Georgian as a “well-researched architectural history” with “exceptional photographs”. On Saturday 16th July, Tim Rawle will be giving a lecture in The Howard Theatre, Downing College, Cambridge. In the story of English architecture and the history of Cambridge University, Downing College occupies a very special place. When it was founded in 1800 through the will of the third Sir George Downing, Baronet, no college had been built in Cambridge for more than two hundred years. The original buildings were completed between 1807 and 1820 to the designs of the architect William Wilkins, but owing to a long and expensive legal battle instigated by the last Lady Downing, Wilkins’ concept was sadly never realised to its full and magnificent potential. Nevertheless, it was the first major scheme in England to be built in the neo-classical Greek Revival style, and it was the first instance of the spacious campus plan in collegiate architecture. For the last two hundred years, the College has been on an exciting classical adventure, fully committed to the defining style of its original buildings for all subsequent additions to its spacious site in the centre of Cambridge. 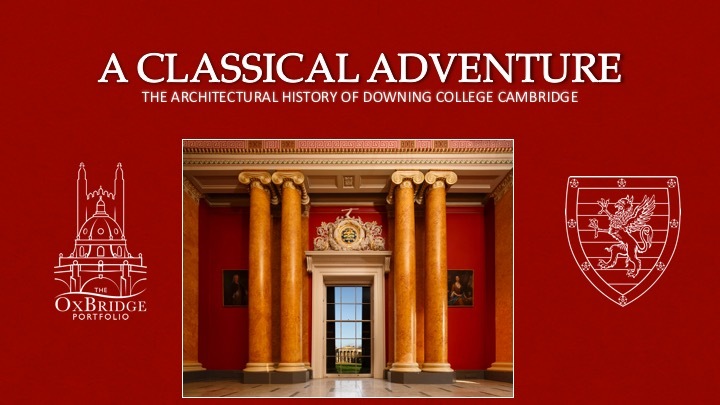 This is the first book to set Downing College fully in the context of the history of Cambridge architecture, and to tell the story of its buildings from the earliest plans and ideas through to the college of today. Amongst the many presentations we create for our customers, it is often the case that creatives like to learn how to produce a presentation for themselves. In this instance we assisted by providing Tim with the knowledge to create his design, build templates, input his own content and be able to deliver his presentation to a discerning audience. Creating images at the correct optimised size for a website or presentation can be daunting if you have never had to consider or understand the pros and cons. Much of our consultation was teaching the technicalities behind presentation creation and the balance between quality and file size. When producing a book, images need to be high resolution and pin sharp, whereas a presentation only requires images to be shown at 72dpi as they will be projected by a computer display. In order to make sure that quality was not compromised, a portion of the images were created at 120dpi, especially where small writing on an illustration is needed to be legible. We are certain the lecture will be a success and everyone will be fascinated by the history of the College, supported by Tim Rawle’s charismatic character and superb photography. If you need help creating your own presentation or would like us to team up and create yours to present, call us now on 01379 676720 and consult with Karin.